Poisoning occurs when you are exposed to a harmful substance that can cause a wide spectrum of damage to the health. It may even lead to death. All cases of Poisoning should be evaluated by a trained medical professional, as soon as possible! DO NOT wait! Failure to obtain evaluation as soon as possible may result in serious injury or death. Call 911 (or your local emergency number) immediately, if you suspect Poisoning. What are the Causes of Poisoning? Exposure to chemicals like detergents, household cleaning materials, gasoline, paint materials, insecticides, cyanide, etc. What are the Signs and Symptoms of Poisoning? How is First Aid administered for Poisoning? 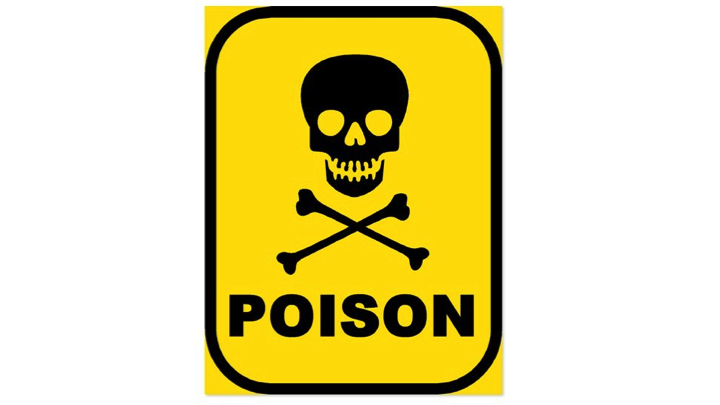 If you suspect Poisoning, call National Poison Control Center at 800-222-1222 and provide as much information as you can; even if the person does not have any symptoms. Who should administer First Aid for Poisoning? The person himself/herself or someone nearby may begin to administer First Aid. Call 911 immediately as mentioned before. What is the Prognosis of Poisoning? The prognosis is dependent on the potency of the toxin, the severity of reaction, and timely manner in which treatment is administered. How can Poisoning be Prevented? Wear appropriate protective wear when working with chemicals/plants, during hiking/trekking, etc. Goktas, S., YILDIRIM, G., Selmin, K. O. S. E., YILDIRIM, S., OZHAN, F., & SENTURAN, L. (2014). First Aid Knowledge of University Students in Poisoning Cases. Turkish journal of emergency medicine, 14(4), 153-159. Kupferschmidt, H. (2002). First aid in poisoning: poisoning-induced coma. Praxis, 91(36), 1443. Safety, W. (2003). Health. National Institute for Occupational Health and Safety: Atlanta, GA, USA. Available online: http,//www. cdc. gov/niosh/blog/nsb111907_truck. html (accessed March 11, 2009). Senanayake, N., & Peiris, H. (1995). Mortality due to poisoning in a developing agricultural country: trends over 20 years. Human & experimental toxicology, 14(10), 808-811. Bird, C. A., Gardner, A. W., & Roylance, P. J. (1974). Danger of saline emetics in first-aid for poisoning. British medical journal, 4(5936), 103. Press, E. (1957). Public health aspects of poisoning. Journal of the American Medical Association, 163(15), 1330-1332.